Findley Heights, North of Findley Elementary off Saltzman Road. The West Hills Homes NW team announced the launch of their new business and first homebuilding venture, Findley Heights, on Friday, April 8. Located in one of the most desirable areas of Washington County, West Hills Homes was excited to break ground on the 40 home community and expand their established building expertise to Bethany/Bonny Slope in suburban Portland. 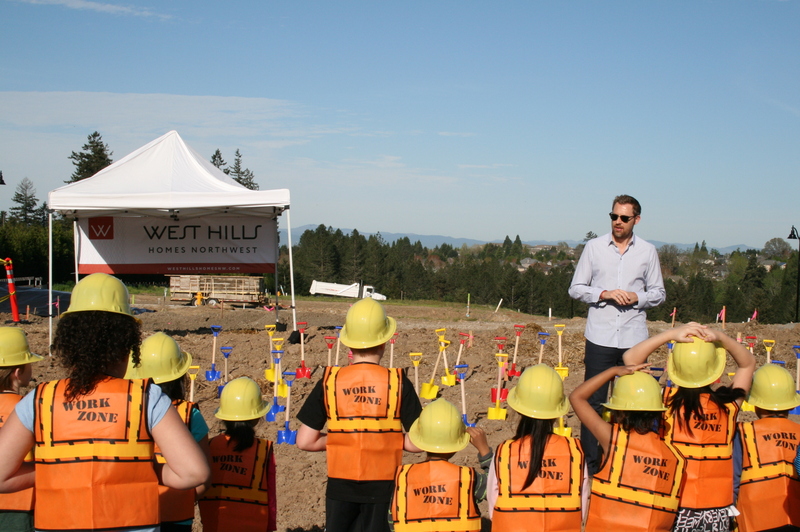 To honor the surrounding neighborhood, West Hills Homes NW invited 50 kindergarten and 3rd grade students to learn about the homebuilding process and help break ground. Each student was outfitted with a West Hills Homes NW hard hat, construction vest and mini shovel. Together, the West Hills Homes NW and Findley Elementary students had a great time getting their hands dirty on the job site!